The Plain Janes and More! It’s been a while since my last post, and I know I’m a busy guy with a full-time job and head-coaching position; however, it is no excuse. I need to write more. I want to get more comics’ info into the hands of teachers, and I want to be a large part of expanding the educational comics’ community. I went out to lunch with Ronell (www.thecomicbookteacher.com) a few days ago, and he echoed the same attitude, so we decided to push each other to each post a blog every other Friday…sorry, I know it’s Saturday, but yesterday was Christmas; please try to find it in your merry heart to forgive me. Ronell and I are going to work our best to keep each other accountable, and we want our readers to do the same. If you see that a week has gone by, and one of us has not posted, get after us. We’d appreciate it! With that said, my post today is a cool one! As you might be aware, I teach a comics course, and last semester one of the assignments was to write a blog-style review of a comic series (at least a five-issue run) or graphic novel. One of my students, Taiah W., was reading The Plain Janes, by Cecil Castellucci and Jim Rugg as her selection. I was lucky enough to have presented with Cecil at San Diego Comic Con this past summer, so I asked Taiah if she’d like me to reach out to Cecil and see if she’d be willing to answer a few questions for her blog review of the book. Cecil was, of course, more than awesome and agreed to converse with Taiah about the book. What follows here is Taiah’s review of The Plain Janes including her interview with Cecil Castellucci, and my after reflections. TW: The plot is one of the most original and complex I have seen. What inspired you to write it? CC: Thank you. I’ve always been a believer that art saves. I kept having this image in my head of these four girls all named Jane. Where one Jane sits with them everyday thinking that they are cool, but the other ones always wish they were sitting at a different table. Until something unites them. The idea being that we sometimes think that other things are cool, but really cool might be the table that we are already sitting at. The other part, the bombing in Metro city, that comes from a personal place. I was in an IRA bombing when I was a young girl, and it has marked me. I wanted to talk about trauma and recovery and how art really can save us. Their doing street art is a way that Main Jane heals. An attack becomes something beautiful. So it was two separate ideas that blended together. TW: That’s amazing. Sounds like your story would make a cool film. ​​Why did you decide to make The Plain Janes a graphic novel, instead of a book or film? CC: I really didn’t know what it was. I knew that it wasn’t a novel. I thought maybe it was an animated TV show or something. It wasn’t until DC Comics called me and asked me if I had any ideas that I thought it would make a great comic book. TW: Main Jane is a pretty complex character. Were there any difficulties or things you wanted to avoid when developing her or any of the other Janes? CC: I think that it is always hard when you are writing a comic and you are restricted by page count to get to the gravitas of a character. So I wish that I could delve a little deeper in all of the Janes. There weren’t things that I wanted to avoid, more like I wish I could expand. Maybe more home life of the other Janes. TW: ​​Reading the book, I felt myself connecting to Brain Jayne. Is there any character you identify with more than the others? CC: I relate a little bit to all of them! They are like different aspects of me kind of fleshed out. But I do love Main Jane and her determination to heal and to make art. I find that really comforting. I also like how she brings people together. TW: With that being said, is there was one message you would like your readers to get from The Plain Janes? If so, what would it be? CC: I suppose it would be that we should turn to art when we are confused or hurt or happy or sad. That art shows the way to our fundamental humanity. That it is beautiful. I would want people to consider what is art. And how it can help us heal. And how it can bring people who are very different together. I would hope that people would look up when they walk and see art around them, the obvious and the secret and be glad for it. TW: I’d like to thank Cecil Castellucci tremendously for her time in responding to my questions, and I realize that I haven’t said much about the book; however, Castellucci has created more than just a graphic novel, and I wanted to explore that with you through the questions that I crafted. For me, this book was an experience, and the only way to fully understand it is to read it for yourself (which I do highly recommend). 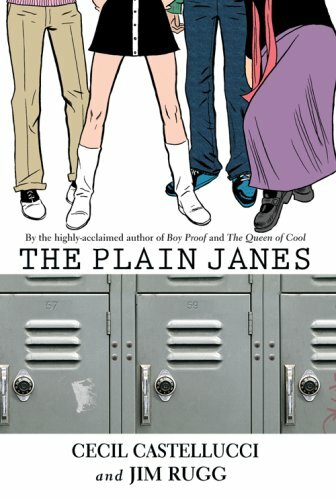 The Plain Janes has become my favorite comic, novel, storyline, etc. period. And I’m sure that once reading it, you’ll understand why. This book is a prime example of comics branching out from storylines of men in tights, and I greatly look forward to future works of Ms. Cecil Castellucci and Mr. Jim Rugg. I hope you enjoyed Taiah’s questions and Cecil Castellucci’s answers as much as I did: there are some thoughtful issues raised by both. My personal review of the book seems a bit out of place after that exchange, but I will say that I enjoyed the book, and the issues raised could be amazing classroom conversation starters. My only real criticism of the work is that the book is short, and I’m guessing the authors were limited by page constraints, but I wanted a little more resolution but only because I became so invested in the characters. This book is appropriate for junior high and up, and if you have a graphic novel classroom library, this book should, for sure, be on your shelf. I’d like to thank Cecil Castellucci once more for taking time out of her busy schedule to chat with us. If you’d like to find out more about Cecil and her projects, head over to https://castellucci.wordpress.com/ and explore! Sorry this latest post took so long. Ronell and I will be working hard to bring you quality content on the regular this coming year; it’s our early New Year’s resolution! So please follow us and get ready for an awesome year of talking comics! Great blog post! Keep it up!